As chiropractors, Dr. Lindsay and Dr. Dan deliver drug-free, surgery-free health care to entire families. They have an emphasis on pediatric chiropractic that allows your baby or child to get the most out of life by having a properly functioning nervous system. There are numerous studies showing the effectiveness and safety of chiropractic care for babies and children. Our youngest patients respond so quickly that it often takes just a few visits to see results. Chiropractic is an increasingly popular choice for parents who want their kids to lead healthier lives. Our team offers your children one of the least invasive, simplest, most conservative options for healthcare available. We can give you answers when you’re not sure where else to look and haven’t seen success with other avenues. With our natural techniques, we can safely and effectively address many common symptoms that today’s children live with. Your young ones can see their wellness increase, experience fewer colds and flu, have more energy and sleep better. Conditions such as colic, bed-wetting, reflux, constipation and behavioral disorders can see remarkable improvements with chiropractic care. We’ll start by taking quick, noninvasive scans that show us the health of your baby or child’s nervous system. Since they can’t communicate like adults and let us know what their issue is, these scans are vital in identifying problem areas. Once located, we use a gentle touch to remove the interference in the nervous system. 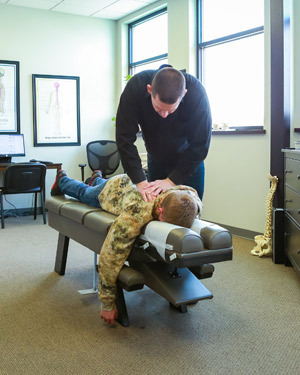 Chiropractic adjustments for a child are different than that of an adult. On our youngest patients, we use the pressure that would be required to test the ripeness of a tomato. It’s very soft, and there is no popping, cracking or twisting. Same-day appointments are available. Contact us today to find out more about what we can do for you with family health chiropractic care!